From their first hesitant steps, children want to physically play. Moreover, children need active physical play. For children, physical play is as natural as laughter. And it’s just as healthy. In the US, children have countless opportunities to take part in organized sports. Over 21 million kids between the ages of 6 and 17 regularly participate in various programs of organized play, from soccer to baseball to basketball to track and field to gymnastics. Participating in sports is one of the most beneficial activities available to children. It’s all about running, jumping, and learning to work with others toward achievement of a common goal. This improves a child’s health, both physically and mentally. Organized sports teach the benefits of cooperation, respect for others, and self-control. Youthful sports participation can instill healthy habits that will last a lifetime. And, when it’s done properly, all this valuable physical play is pure fun. 40% of the injuries incurred by our youngsters are sports related. About 35% of school-age children will suffer a sports related injury that is serious enough to require medical attention. Because youth sports involve running, jumping, landing, sudden twists, and rapid turns, harsh impacts to the feet are inevitable. It’s no wonder that our children’s feet and ankles are by far the most common sites of injuries incurred during participation in sports. The ankle is a miracle of design. It enables our feet to rapidly move in various directions, sometimes simultaneously. This convoluted set of movements is made possible by strips of collagen known as ligaments and tendon. These tough belts strap the bones of the ankle tightly together, yet still allow the flexibility demanded by sports like soccer and gymnastics. The difference between ligaments and tendons is that ligaments connect bones to bones and tendons connect bones to muscle. An overstretching or tear of a ligament is known as a sprain, and similar harm to a tendon is known as a strain. There’s usually no difference between the prevention and treatment of sprains and strains. Until their growth is complete, children’s bones are immature are highly vulnerable to injuries caused by repetitive stress. So, although practice might make perfect, proud parents with visions of scholarships, as well as ambitious coaches who may overemphasize winning, need to recognize and avoid the perils of overtraining. Proper footwear is an important component of an effective sports injury prevention program. When available, use shoes specifically designed for a single sport. And frequently replace those shoes, no matter how attached your child is to a worn-out pair of soccer shoes she wore during that championship season. Parents should help coaches and referees search playing fields for gopher holes, divots, and loose earth. These are sprains, strains and fractures waiting to happen. Before signing up with a team, parents should make sure the coach is committed to a systematic program of injury prevention. Make sure your child’s coach is appropriately licensed by the sport’s governing body, and fully trained in first aid. Include warm-ups and cool-downs as an integral part of your young athlete’s regimen. And don’t forget that adequate hydration is vitally important. Take it slow. Ask your child’s coach to gradually ramp up the stress and strains imposed on your child’s feet and ankles. Going full throttle too soon can lead to long-term problems. Finally, be sure to get a preseason physical examination of your child by a podiatric professional. This will provide valuable insurance against latent foot and ankle problems, which can suddenly turn into serious and long-lasting injuries. When players injure an ankle or foot during a game, they should immediately leave the field or court. It can be humiliating to be helped or carried off the field, and most kids will want to tough it out. But such displays of bravery can lead to exacerbation of a previously minor injury. If the pain is severe, or the injured ankle or foot looks misshapen or deformed, seek medical treatment right away. Remember the acronym RICE (rest, ice, compression, elevation). Immediately immobilize the foot/ankle, apply ice, tightly wrap the area with elastic bandages, and keep the foot lifted. Don’t take ankle sprains and strains lightly. An athlete who returns to the field or court without allowing an ankle to properly heal is inviting chronic instability problems. The rehabilitation of every serious foot and ankle injury should be overseen by a qualified podiatric therapist. 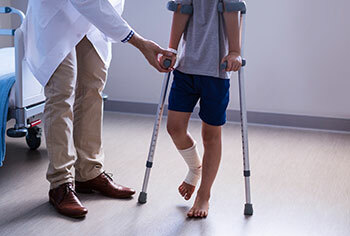 Whether your young athlete’s ankle is injured by a slide tackle in soccer, a hook slide in softball/baseball, or a bad gymnastic landing, the podiatric professionals of UFAI are available to provide the healing protocols which will minimize any injury interruptions in your All-Star’s athletic career. If your child is experiencing foot problems, we’re here to help. Our nationally recognized foot and ankle specialists offer the most advanced podiatric care and the highest success rates in the nation. 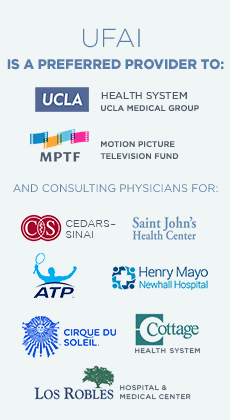 We are leaders in the research and treatment of all foot and ankle conditions. For adults and children alike. Previous: Topaz, Tenex or Tenjet: which is best for chronic plantar fasciitis?